Over the past two months, a series of leaked documents from Ethiopia’s powerful political elites have been circulating online. Among other revelations, the leaks show that the Ethiopian government has been paying online commenters to influence social media conversations in the ruling party's favour. The documents include hundreds of pages of chat logs and email correspondence of Ethiopia’s top government officials, multiple governments planning documents and top-secret meeting records. 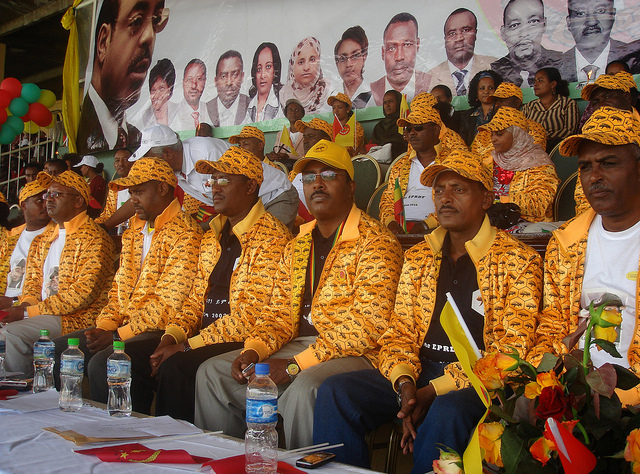 The leaks have come at what may be a turning point in Ethiopia's recent political crisis. Since mid-2015, thousands across Ethiopia rose up, demanding more political freedoms and social equality and a stop to government land grabs in the Oromia region, which represents Ethiopia's largest ethnic group. The government response was brutal: Hundreds have been killed, thousands have been arrested, and critical voices — both on and offline — have been systematically silenced. Among the recent leaks, which began to circulate on Facebook in November 2017, one of the most revealing documents is a list of individuals who appear to have been paid to promote the ruling coalition on social media. The list shows the names of the so-called “social media commentators” along with their job titles and a precise amount of money that they apparently received for their online postings. Most of the people listed are government employees. The list corroborates previous evidence that the Ethiopian government has been hiring online commenters to promote its agenda and harass its opponents. Online communities in Ethiopia have been calling these paid commenters “cocas”, a colloquialism in Amharic (the most widely spoken language in the country) that can be translated as “contemptible cadres.” In Amharic, this term typically refers to people who sell themselves for easy money. But in this case, most of the commenters listed in the leaked directory are already on the government payroll. Who is responsible for the leaks? The origin of the leaks has been rumoured and contested at several levels. The documents were originally sent to diaspora activists from the at least two Facebook accounts, both of which belong to government employees, in November 2017. 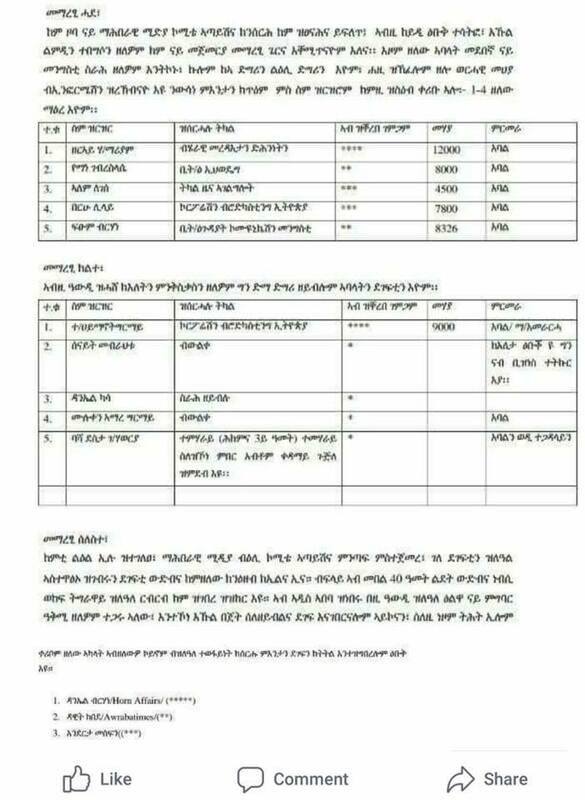 The first known leak, of the “coca” list, came from the Facebook account of Gebremichael Melles Gebremariam, an employee of the communications affairs office of the Tigray state. Gebremariam first denied sending the documents, claiming his account was hacked. But he then backtracked on this claim. It is now rumored that he has been dismissed from his job. Soon after the initial leak, more documents began arriving in the inboxes of diaspora activists, this time coming from the Facebook account of the Director of the Federal Communications Affairs office, Haddush Kassu. Shortly thereafter, Haddush began to publicly shame those government officials who are implicated in the leaks. On January 18, he denigrated Deputy PM Debretsion Gebremichael in a public Facebook post. It is unclear whether Haddush sent the documents himself have been hacked. The revelations of political and state officials paying “costs” to promote the ruling party agenda online correspond with a recent rise in polarization and hate speech on social media, alongside increased online persecution of independent journalists. The leaked “coca” list reveals that at least thirteen commentators were each paid at least USD $300 (a large sum in Ethiopia, where average GDP per capita was USD $660 in 2016) for blog posts or Facebook messages that they wrote at the behest of the ruling coalition. Among individuals named on the list are Daniel Berahane and Dawit Kebede, publishers of two Ethiopian internet news site HornAffairs and Awaramba Times respectively. The two journalists have long been accused of cheer-leading a pro-government information campaign, especially during a heightened political tension. In recent years, independent Ethiopian journalists reporting on government affairs, corruption and human rights have been arrested or exiled en masse. The resulting gap in news coverage has thus been filled by opposition activists and protesters who often work with diaspora-based media outlets to draw global attention to the brutal military crackdown on protesters that has killed more than 1200 people and has led to several mass arrests since mid-2015. On the heels of the list came a separate leak of what appears to be a proposal to counter opposition groups using social media platforms. The Amharic-language document from the office of Ethiopia’s longtime governing coalition, the Ethiopian People’s Revolutionary Democratic Front’s (EPRDF), enumerates solutions and strategies to curtail the influence of online diaspora-based activists. The document also describes how officials have ordered paid commenters to attack people who call for democracy and to praise the ideologies of the ruling coalition. The document encourages its members to post comments on the internet as if they were regular citizens. Other documents show that Ethiopia’s spy agency, the Information Network Security Agency, known to surveil and censor journalists and political dissidents, issued a money order of USD $12,000 to send two of their employees to China for special training. The documents do not specify what kind of training the two employees were meant to receive, but this information has begun to come to light with the release of subsequent chat logs. 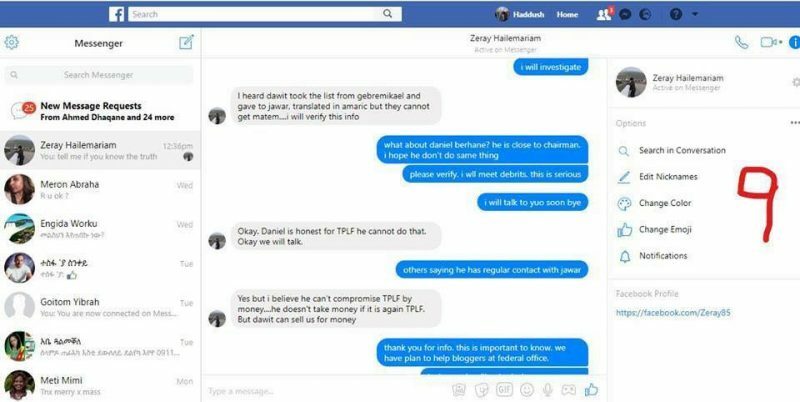 Five weeks after the list was leaked, another document surfaced showing a written exchange over Facebook Messenger between two high-level public servants — Haddush Kassu and a high-level operative of Ethiopia’s spy agency, Zeray Hailemariam — who was furious about the leaks, and the disclosure of the paid commentators. One said the leaks are threats to their security and pledged to seek help from Information Network Security Agency to investigate the source of the leaks. The other blamed a “disgruntled regional communication officer” for leaking the names to diaspora-based political rivals. The exchange between the two top government officials also sheds light on the power struggle at the helm of Ethiopian ruling party, where infighting has led leaders to hire figures like Daniel and Dawit to undermine political opponents or curry favor with diplomats and foreign organizations in Addis Ababa. Daniel and Dawit have been leading voices in the pro-government media backlash against opposition activists and diaspora media. And what is the Minister of Communication and Information Technology up to? Other revelations have pointed to the online habit of Ethiopia’s former Deputy Prime Minister and Minister of Communication and Information Technology Dr. Debretsion Gebremicheal. On December 16, 2017, member of the inner circle of the ruling party dumped screenshots of ten years browsing the history of Dr. Debretsion Gebremicheal on his Facebook page. The details only lasted for about two days. It was removed sometime on December 18, 2017 without any explanation. Debretsion does not have a respect for woman as well as for himself. Okay, you can go ahead say my account was compromised. Does a person has to be hacked ten times? Hell no! For Dr. Debretsion this looks especially bad because he could not even clean his browsing history or encrypt his online communications, which means it was much easier than usual for the hackers to steal his browsing history. It’s quite amateurish mistake for a person who brands himself as one of the country's top ‘intelligence’ personnel. Abebe Gelaw, a prominent diaspora based journalist pieced together a revealing fifteen-page expose after he scrutinized over two hundred pages of Dr. Debretsion’s embarrassing and salacious browsing history. But one of the most interesting aspects of the story itself was the sourcing of the revelations. The documents are said to originate from various sources, some say disgruntled insiders leaked them, others say hackers are responsible. But from an incoherent drip of leaks, a common outlook emerges that there is unprecedented power struggle happening among Ethiopia’s ruling elite.